It also has its faults. It’s expensive: The Connaught bar sells beer at £65. Per glass. Yes, that isn’t a typo. It is busy, the average life expectancy of a cyclist is roughly equivalent to that of a First World War fighter pilot, and there’s a building in the centre of town where they lock up hundreds of the criminally insane with dreadful security which keeps letting them out. But that’s enough about the Houses of Parliament. However London does has its good points too. The British Summer Time Hyde Park concerts are one such Good Point. It’s a chance to go to a music festival, and avoid the downsides. You know, like trudging through four inches of mud and rain for two miles then tripping over guy ropes in an attempt to find your leaky tent amongst a thousand identical such tents, only to get back to yours to find someone else sleeping in it – in a pool of their own vomit. No! London allows you to have the festival experience, and then go home to a nice warm bed, have a shower and feed the cat*. It’s very civilised. It’s a diverse bill every night – the indie kids have The Libertines, the pop crowd have The Backstreet Boys and the hippies have Neil Young and Crazy Horse. But like at Glastonbury this year, the heavy metal crowd has their own night too, with an astonishingly heavyweight bill that includes Motörhead, Faith No More, Wolfmother, Soundgarden and Black Sabbath. On a weekend where Metallica and Iron Maiden are both playing Knebworth, things have never been better for fans of (as Metallica put it at last weekend’s Glastonbury festival) “heavier music”. The only real drawback is the strictly observed need to allow local Hyde Park residents a little peace and quiet after 10.30pm. Let’s face it, if you live in central London, the concept of “peace and quiet” is pretty tenuous at best, what with police sirens, helicopters and relentless traffic being as constant as bad reality TV on our screens. Yet you mustn’t mess with the curfew, even if you’re a Beatle joining Bruce Springsteen onstage, as we discovered a couple of years ago. McCartney may have the Freedom of the City and be able to drive a flock of sheep through The Strand, but woe betide anyone that plays “Hey Jude” at 10.31pm on a Saturday night. All of which drivel leads us to yesterday’s entertainment, and to the headliners Black Sabbath. As the power chords that kick off “War Pigs” play out to a background of sirens, Ozzy takes the stage wearing a cape and an evil grin. 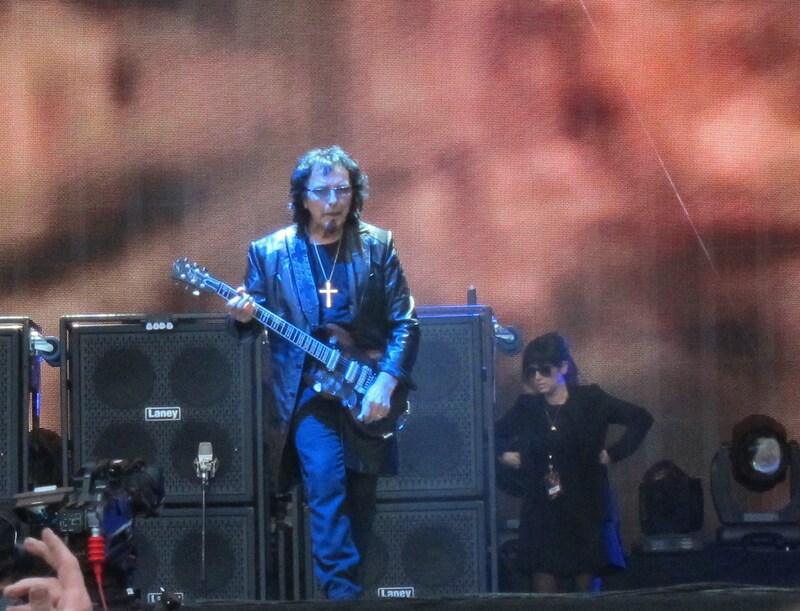 “Generals gather in their masses…” begins Ozzy and the crowd pick up the rest. 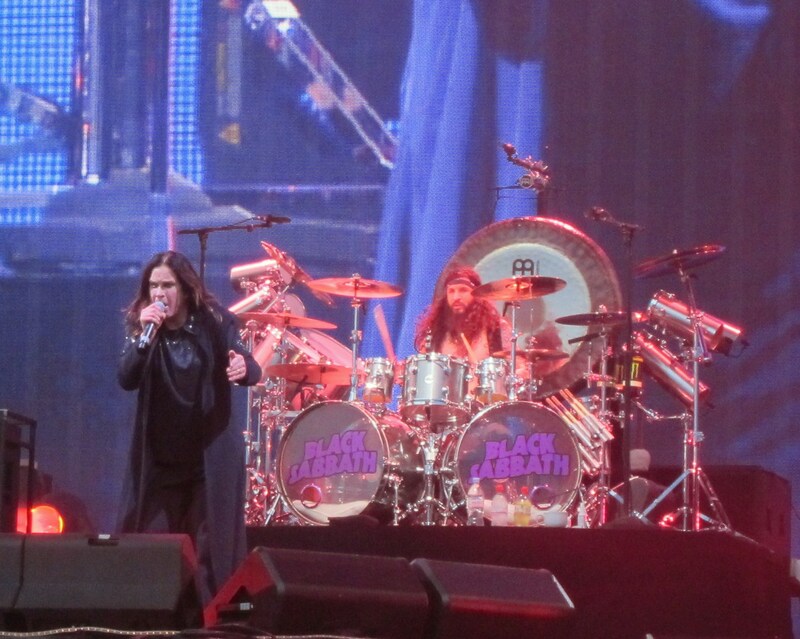 The cloak is discarded as Ozzy introduces “Into the Void” from Master of Reality, which is little short of majestic. The huge crowd eats it up. “Snowblind” follows, “You know what this one is about” adds Ozzy before telling us that today is his wedding anniversary. 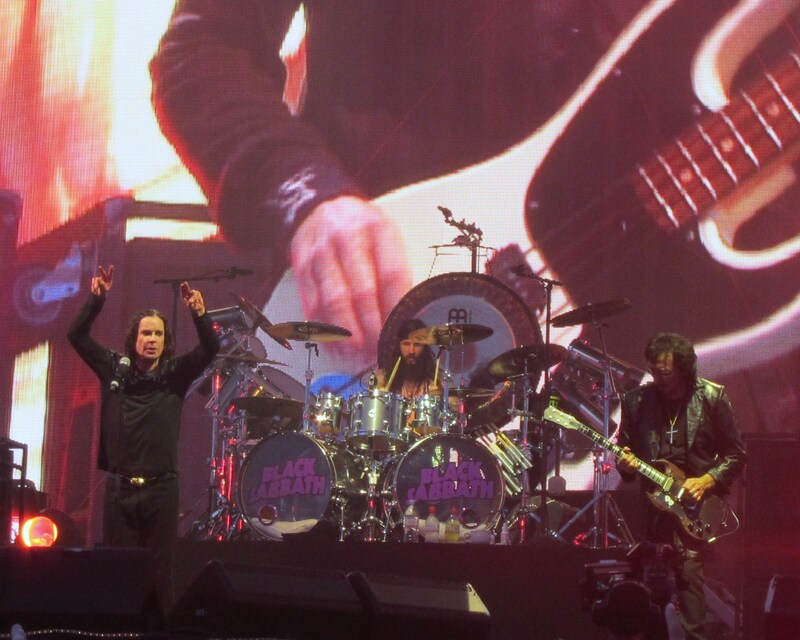 “Age of Reason” from 2013’s “13” follows and the mosh pits form thirty yards back as two songs are plundered from Sabbath’s debut album in the form of “Black Sabbath” and “Behind The Wall of Sleep”. 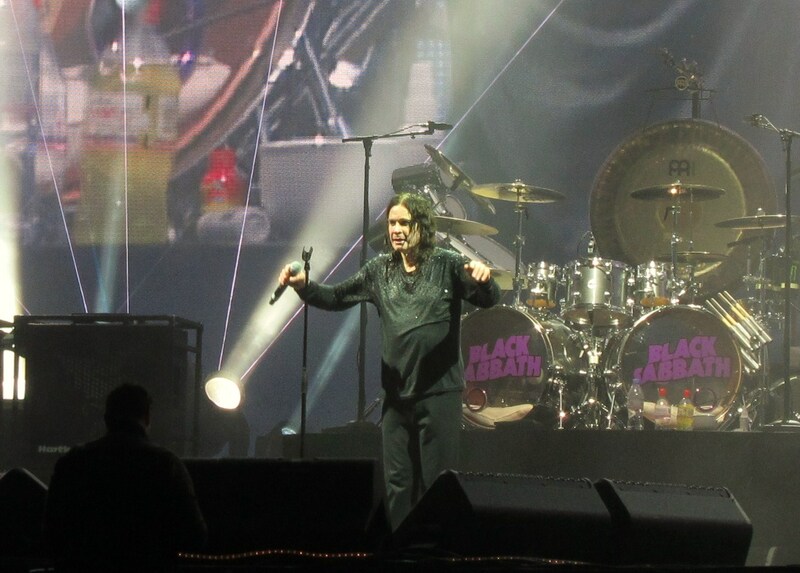 Ozzy is effervescent, waving his hands, then clapping them together, constantly involving the crowd. A brief solo from bassist Geezer Butler introduces “Fairies Wear Boots” which showcases Butler’s fluid runs. Whilst original drummer Bill Ward’s absence is well documented, I wondered if I would miss his trademark jazzy fills, which are an important feature of those early Sabbath albums. However, Animal-from-the-muppets look-and-soundalike Tommy Clufetos does a great job and brings great energy to his performance. Post the obligatory drum solo, we enter the home straight. “There’s a lot of people here – London must be deserted tonight” observes an incredulous Ozzy as he looks out at the crowd through the rain, which has begun to sprinkle down. “Iron Man, God Is Dead”, “Children of the Grave” and “Paranoid” finish things off. 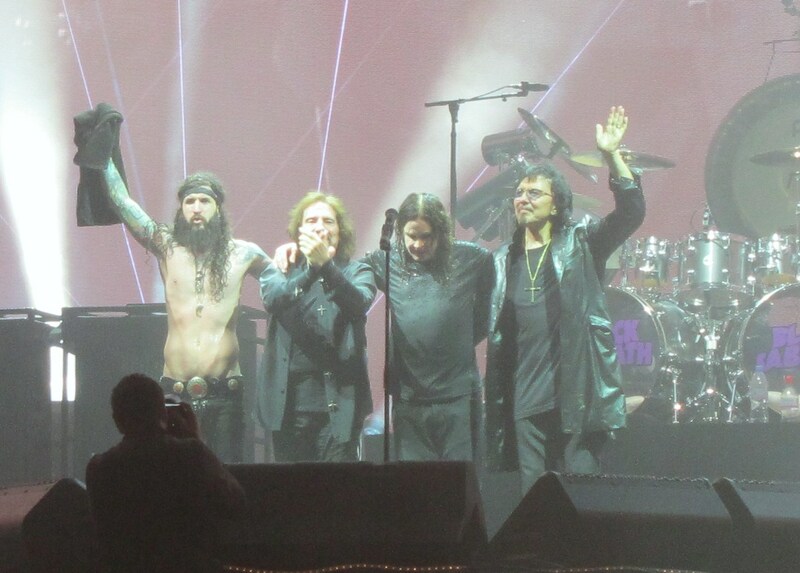 As Ozzy throws his third bucket of water over the front rows (and himself) you can tell what fun he is having. 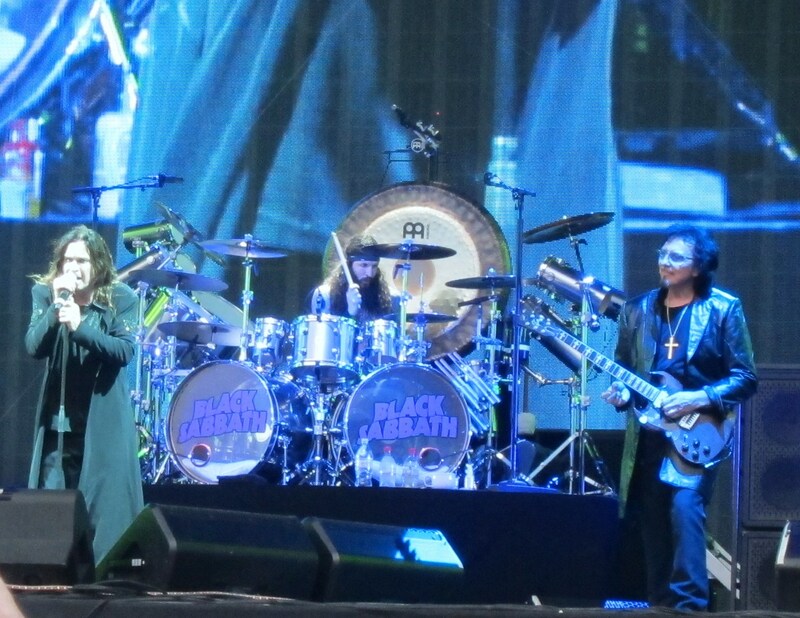 It’s an odd way to make a living, but Black Sabbath do it better than most, and they are still having a lot of fun. * No guarantees that the cat won’t be sleeping near a pool of its own vomit of course, especially if it’s anything like my cat. Man, it is a good feeling seeing Tony up there smiling. A class act if there ever was. Love your take on London. I lived there for a time and will never forget it, but so true, the Tube, the pubs and whatever all are closed by 11. You would think that the city was closed down but look around. There was a guy selling kebabs and shite hamburgers at 2 in the morning right down the street from me. I lived on Queensway, right above Boots, two doors down from Bayswater St. and literally a stones throw from the Park. Imagine, I could have walked to the show and used me own bog. Well, if it’s their own vomit, it can’t be that bad (cue rimshot by dead Spinal Tap drummer). You can’t dust for vomit…. Thought about going then realised it was world Cup quarter finals.Hard calls!